Pulling from a real event (the hijacking of a Japanese embassy in Peru in 1996), Ann Patchett creates a similar hostage situation in an unnamed South American city where 200+ foreign diplomats and government officials are held captive. However, unlike the real story, Patchett includes an opera singer, a beautiful soprano with a magic voice who was brought to the house of the Vice President to sing for a wealthy Japanese guest, Katsumi Hosokawa. The glitch in the hostage scenario is that President Masudo doesn’t attend the event, and he is the one the terrorists want. The invade the Vice President’s house on the night of the big birthday concert, take everyone hostage at gunpoint, and become further enraged (and befuddled) when they learn the that president wasn’t even there. With their plan out of whack, the gunmen decide that the opera singer, Roxane Coss, is the prized possession. The house is awash with conflicting emotions – the hostages are scared, but endeared to Roxane’s singing. The terrorists are angry, but they attend to Roxane’s ever need with great care. The guest of honor, Katsumi Hosokawa, cannot believe his luck – he’s imprisoned with his celebrity crush. It almost can’t get any better than that. I presume that one of Patchett’s intentions in writing this book was to unpack complex human emotion under the thumb of crisis. Told in third person, readers are privy to the inner thoughts and feelings of seven or eight characters. For what it’s worth, I didn’t love that aspect and was actually told in grad school that this is called “head jumping,” a method of writing that we’re supposed to shy away from. My answer to that is, “I’ll do what I want,” but in this scenario, I found the head jumping all over the place. 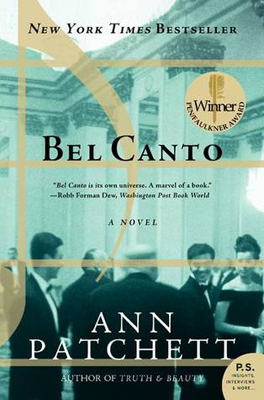 It should be noted that Bel Canto is an award-winning book – the Orange Prize for Fiction and the PEN/Faulkner Award for Fiction – and yet, I did not love it. The tension from the initial take-over by the terrorists was exciting, and the immediate aftermath kept me interested. Then, somewhere in the middle, I got bored. This was a months-long hostage scenario, long enough for walls to come down, for relationships to build, for the terrorists to weaken their resolve. And that process? Super long. Very drawn out. Perhaps I was distracted or I didn’t love Roxane as a character, or maybe I couldn’t connect with any of the main characters, not even a little. And then, like a round lid on a square container, the epilogue didn’t fit the story. Finishing it last night, I was all, “Huh?” This surprises me because I loved, loved The Patron Saint of Liars. Naturally I expected to love Bel Canto. But I just didn’t.